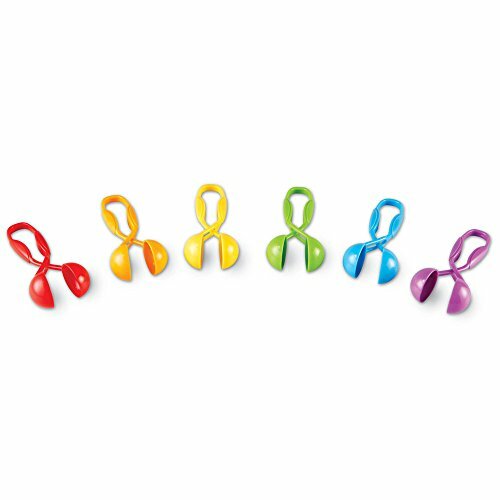 Set of colorful tweezers are sized just right for little hands to squeeze. This fascinating little tool lets kids pick up, move and place small items. Includes 6 tweezers in 6 different colors. Great for picking and placing little items! Take note…these do not close all the way. The child will squeeze the hand but the scoops don’t close all the way regardless of how much they are squeezed. AND the picture they show isn’t deceptive…that is a foam letter, and that is about how far they close. So if that’s not important to you then on another note, they are sturdy and brightly colored and come in nice packaging. These are a waste. There is so little tension that I doubt they would pick up a cotton ball. A child would surely put these down in a short time as satisfaction would be nil. Better to purchase salad/kitchen tongs with wide-ish ends. These are better quality than other brands with similar style I have gotten. I use them in sensory/discovery bins in my preschool classroom.